You are here Home » Case Studies » Making windows the Whiteline way! 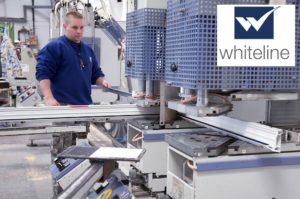 Eastbourne window and door fabricator Whiteline Manufacturing has been in business for 34 years. A privately owned business, Whiteline is run by Managing Director Steve Milham with a team of 100 in support. Supplying mainly home improvement companies who sell into the retail market, Whiteline covers the whole of the South of England, delivering North as far as Ipswich, Cambridge and Colchester. 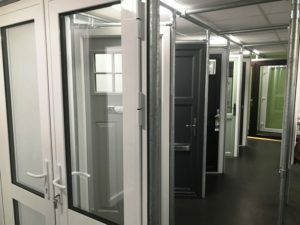 Whiteline offers uPVC (Liniar) and aluminium (ALUK) window and door systems, and the company has developed its own retail brand and a host of exclusive products in order to offer something truly different in a busy, competitive market. Under the PlatinumNRG brand, Whiteline offered a uPVC range which in 2008 was due to be discontinued. 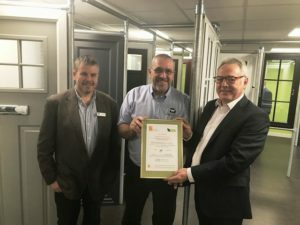 The timing was perfect as Liniar had just launched its chamfered, energy efficient 70mm window system with a number of patents, so discussions commenced. Whiteline wanted Liniar to develop a slim window that was exclusive to them, and after several meetings it was agreed that the company would work with Liniar’s design team, launching the SlimSash chamfered range as a bespoke system. This focus has continued since, with the FlushSash system being developed together with Liniar and Whiteline having exclusivity on the system for the first two years. The Revival system was then developed to add another exclusive product to the Whiteline range. This window system incorporates an 85mm outer frame and deep timber look cill with optional deep bottom rail and working peg stay. One of the first to join the Liniar Approved Fabricator scheme when it was launched, proving excellence in manufacturing to Liniar’s high standards, Whiteline states its mission as offering products of the highest possible quality. Whiteline was the first Liniar customer to achieve acoustic ratings of 44 decibels from BM Trada, certificate number 001. 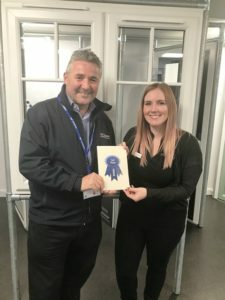 In order to continue this commitment to excellence, Whiteline was also delighted to become one of the first Liniar fabricators to be CORGI Fenestration Scheme registered. Whiteline seeks business partners, not customers – seeing itself as a facilitator in helping customers develop themselves. With this in mind, Whiteline offers its customers whole support packages, not just windows. Over the last two years Whiteline has made a significant investment in facilities, machinery and people. New machinery has been custom designed and built to Steve’s exact specification, ensuring no-one else anywhere in the world will be able to make a ‘Whiteline standard’ window. In the same way Whiteline sets itself apart from its competitors, it recognises the need to help its customers offer something to differentiate themselves to consumers. 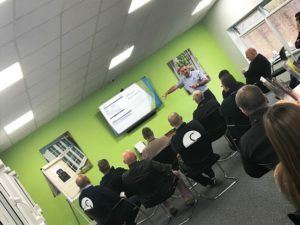 In addition to spending around £1.6 million on machinery, the company has also invested in a brand new showroom for customers to use, together with a training suite. Over the last few years Whiteline has been scoping and developing software tools that are quick and easy for customers to use, and which will help them streamline their installation businesses. A bespoke CRM system includes lead capture and order processing facilities; customers can create their own customised brochures and even a website – and the latest software, due to be launched in 2018, offers a full end-to-end app for installers to use in front of their customers. Fengo2 is linked to Whiteline’s Window Designer software, and covers the full product range. Installers will be able to demonstrate the different options available to the consumer, and build their ideal quotation as they go. The software will produce a quote and all necessary paperwork, and will even allow consumers to visualise different product options on a photograph of their own home, helping the decision making process move more quickly. Once orders are confirmed, the app allows the installer to send its order straight to Whiteline so production can commence – further helping to speed up lead times. The software developed by Whiteline is available to all of its customers, those using it already are experiencing the benefits. As a result, customers who come to Whiteline stay with the company. 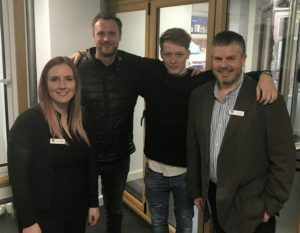 But as well keeping long-standing relationships going, Whiteline is also keen for a younger generation of window installers to see the benefits of its offering, and is hoping its bespoke software and apps will facilitate this. The two open days in December 2017 were testament to the relationships the company has with its customers, with over 100 attending to tour the facilities and meet Whiteline’s suppliers, including Liniar. Window Wise (Sussex) has been a customer of Whiteline since 1992. Managing Director Tim Briggs attended the open day, and was nothing but complimentary about the company and its team. 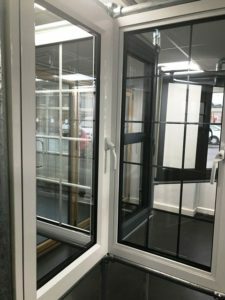 A privately owned business, Window Wise has a showroom and offices in Haywards Heath, mid Sussex. It covers the central Sussex area, with around a 30 mile radius, and was established in 1990. With turnover of £2.2m, four installation teams, three sales representatives and a team of 16 in total, the company first selected Whiteline through geographic convenience. Only 40 minutes’ drive away, it was ideal for being able to pop in and for ensuring speedy deliveries. “We were delighted that Whiteline wanted us, along with other key customers, to be a part of the decision to move to Liniar. 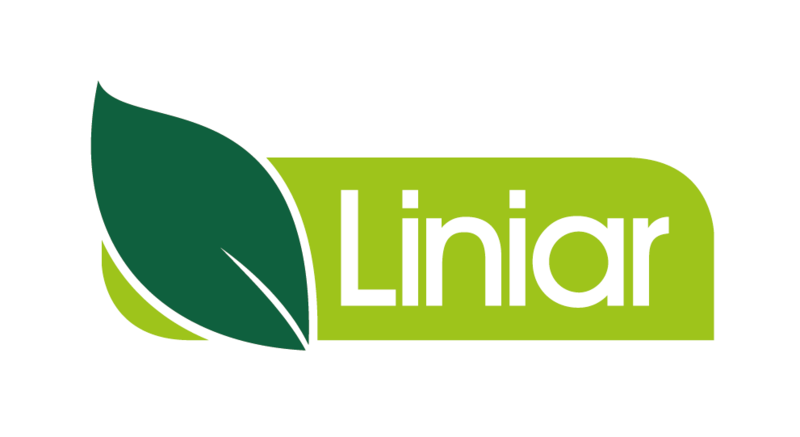 I was invited to Liniar’s head office in Derbyshire, and was instantly impressed with the high standard of the facilities – along with the team’s willingness to develop the SlimSash system as a point of differentiation for Whiteline’s customers, including us. “Over the years, of course we’ve looked around from time to time – but Whiteline has consistently impressed and looked after us. The systems, the customer service, the fact Whiteline never sits still. The company is always looking for new products, for new ways of doing things – and that gives us more to offer to our own customers. “The quality of the product itself goes without saying – not just profile but hardware too. We receive one or two deliveries every week, and the service levels are always very good. “We’ve looked at the software in the past and now feel ready to take it on. It will streamline our processes and help the homeowner to make decisions more easily and quickly. Steve understands our needs and can see things from both sides of the fence – both fabricator and installer. “I think we get on so well as we both have a similar mindset – we’re focused in the same direction, and that includes quality, high standards and reputation. We don’t advertise at all – it says a lot that all of our work comes from word of mouth. 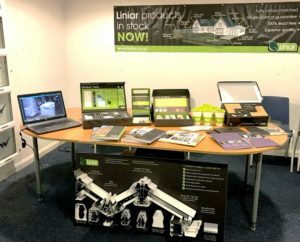 An example of a more recent convert to Whiteline’s customer base is GX Home Improvements from Buckinghamshire, which was represented at the open day by Renny King and Adam Boulter. The firm, which focuses mainly on the retail market with a small amount of commercial work including Eton College, has three fitting teams and started working with Whiteline in early 2017 after meeting with Business Development Manager Shauna Burke. Renny and Adam explain why the company made the decision to move to Whiteline. “We were getting a lot of flush sash work, mainly based on its appearance – we’re finding many homeowners love the sleek ‘timber replica’ look of these windows, especially the mechanically jointed system. As the Revival range is unique to Whiteline, it means we can offer something other installers can’t – and that really appealed to us. “We’re also pleased that Whiteline make sure they don’t take on other customers in the same area as us, which means we’re not competing with the same product offering. “Another reason we chose Whiteline was for the support they could offer. The knowledge and expertise within the Whiteline team is second to none – they understand what the customer needs, and offer solutions before you even know you need them in some cases! It goes without saying that the product quality and the customer service are both excellent too. Find out more about Whiteline, Window Wise (Sussex) and GX Home Improvements.